Here my family's homemade spaghetti sauce recipe. It is great with meatballs, and is the best spaghetti sauce recipe we've tried. We like to simmer meatballs in the sauce to serve spaghetti and meatballs, as you can see from the picture, but you can choose to omit this step and have a meat free sauce. Or, you could instead make this sauce and simmer other meat in it of your choice to make a meat sauce, which we also do sometimes. You can also add more or less spices, to suit your family's taste, so the possibilities are endless, really. Here is how to make spaghetti sauce yourself, with a basic recipe, that you can use in lots of variations. * I have found that every family has a different preference range for how much garlic to use in their homemade spaghetti sauce recipe. You can add or subtract cloves depending on how much your family likes. For example, our friends who really love garlic a lot put in 10-12 cloves! ** You only need the olive oil if you are not browing any meat to go into the sauce. If you use the pan you browned your meat in to cook your homemade spaghetti sauce it will add a nice meaty flavor to the sauce. *** We like our homemade spaghetti sauce recipe sweet, but if you prefer a sauce that is not so sweet I suggest cutting this back to 1 tablespoon of sugar. Add your olive oil to the bottom of a large sauce pan that you can later cover (or use the same pan you earlier browned meat in, without first rinsing it, and use that fat and grease instead). Once the oil is hot add your onions to brown, cooking them for approximately 2-3 minutes, and then also add the garlic to brown. Continue cooking for another 2-3 minutes. 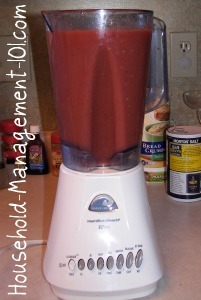 While those ingredients are cooking put your tomatoes, sugar, salt, pepper and basil into your blender or food processor and blend everything together, as seen in the picture on the left. Pour the sauce mixture into the sauce pan with the onions and garlic and bring to a boil. 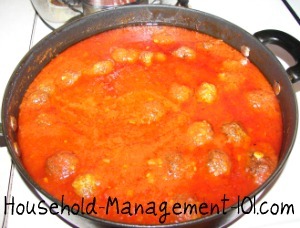 If you are adding meat or meatballs to the sauce add them after the sauce begins to boil. Then, reduce your sauce to a simmer and cover it. Let the sauce simmer for several hours. At a minimum the sauce should simmer for at least one hour, but to completely cut the acidity in the tomatoes we have found it needs to simmer for at least two hours. The longer the better though, really. Stir the sauce occasionally during this time, and do not let it boil again. Before serving taste the sauce and add any additional spices, such as sugar, salt, or whatever else you think is needed to taste. This is definitely a kid friendly recipe, and although my kids don't mind store bought spaghetti sauce on busy nights when Dad makes this sauce it is a real treat. They love hearing that we are having this homemade spaghetti sauce recipe. I hope your family will enjoy it too!